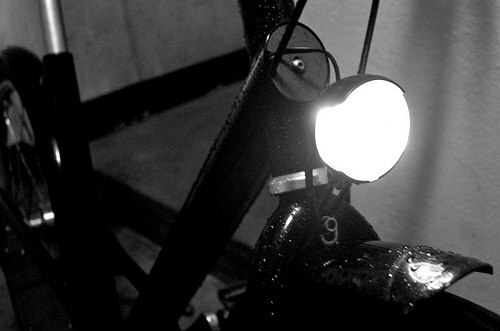 All the light you need for year-round urban riding! The dazzling Lumotec IQ Cyo may be an expensive and over-the-top choice if 40mph descents in the middle of the countryside at 3am aren’t top of your agenda. 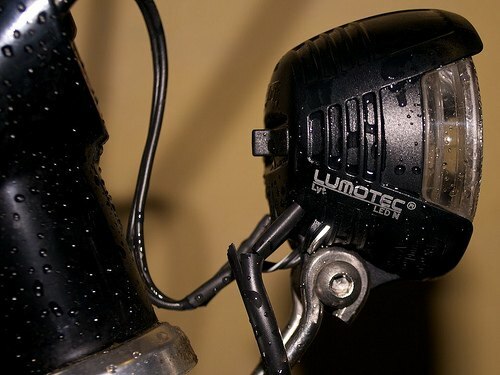 The Lumotec Lyt is a budget-priced dynamo headlight which offers absolutely killer performance for urban environments. The output is markedly less than a full-on headlight like the Cyo but you are paying a fraction of the price. Aimed high, the Lumotec Lyt will still sear the retina of distracted motorists and is adequate to ride (with care) on unlit paths or roads. As with all shaped-beam headlights, the key advantage of the Lumotec Lyt is that it puts photons exactly where you want them and not where you don’t (it doesn’t, for instance, spray them up at the poor chaps in the International Space Station, like any old Cateye). Unlike more dedicated road headlights the Lyt is heavily designed towards lateral / off-angle visibility, with very bright projection to either side that will leave your fellow road users with nowhere to hide. It also includes an integral front reflector which becomes backlit when in motion, so the total area of the light is very much larger than an average commuting LED. In fact, the surface area of the Lyt is an impressive six times (6x) larger than a 1″ diameter high power LED headlight, making it much easier for other road users to calculate your position. Such is the level of consideration put into continental headlights! If you choose to use/abuse the shaped beam of the Lyt by lofting it directly into drivers’ eyes, I’d put it up against any reasonably priced battery light on the market for raw power (in the sweet spot, it matches our three sets of £100+ Ay-Up MTB lights). It just doesn’t have as large, useful or far-reaching a ‘sweet spot’ as headlights like the Cyo. Obviously, to power a dynamo light you are going to need a dynamo – either built into a hub or a roller which acts on the sidewall of your tyre. This increases the initial investment but please believe me, I wish I’d spent five times as much on a dynamo hub when I first started riding at night than go through the pain of endless battery lights that everyone else is putting up with. We have three dynamo hubs now – you’ll never look back. 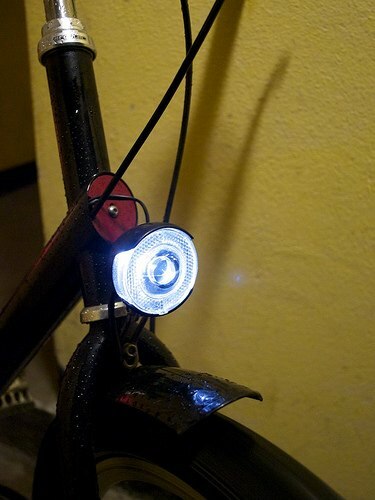 As with all dynamo lights (and as I observed for the Cyo), the Lumotec Lyt stays on your bike unless you want to spend five minutes with a toolkit every time you lock it up. I’ve had no issues with this, hopefully because local thieves can’t be bothered to spend five minutes with a toolkit either (for a light that won’t work without a separate power supply!) but YMMV. As with all dynamo lights, you can buy the Lumotec Lyt equipped with a capacitor ‘stand light’ mode, which keeps it bright while you’re stationary in traffic. I recommend avoiding the slightly cheaper non-standlight models (in B&M branding, you need to get a Lyt “Plus” for the standlight feature), unless you like to stand in the dark in the middle of the road when waiting to turn right! As mentioned above, a light with ‘plus‘ in the name has a standlight (highly recommended). A light with ‘senso‘ in the name can tell when it’s dark automagically (in the UK, this generally means it will always be on except in direct sunlight). The ability to switch the light off manually is distinguished by the letter ‘N’. Even lower power and cheaper basic versions are distinguished by the letter ‘B’. So, a Lyt B N Plus is a basic (15 lux) manually switched light with standlight feature. Similarly, a Lyt Senso T is a 25 lux automatically switched light with daytime running LEDs – no standlight. Some combinations may or may not exist, and price generally increases the more letters you add. My personal recommendation is for the straightforward Lyt Plus (25 lux unswitched/always on, with standlight). 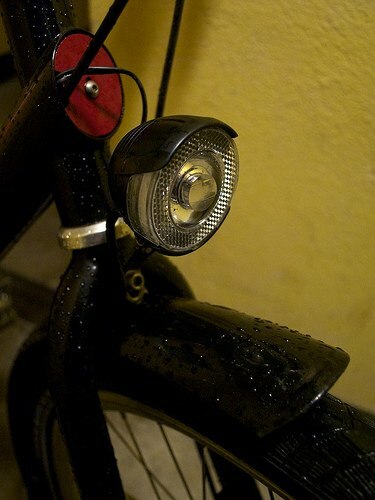 If you want your bike to be equipped to ride at any time of day or night, with a powerful but great value light that isn’t easy to steal and never runs down, you owe it to yourself to get in on something like this. Really. A minor point with dynamo lights you can’t turn off. If you regularly use trains at night you might find some platform staff get upset if you are displaying a similar kind of white light as they use to signal trains to leave. For an easy life, I’m glad I went with a switch! I had one of these & the standlight capacitor came loose & fell off just after one year. It rattles around inside the case & the standlight no longer works. There is no way to remove the lens & repair. To be fair, B&M honoured their two year warranty & replaced it. LOL. I have had that exact problem in a railway station. My rear light was on, I was unaware (at the time) that it was controlled with the front light switch, an over zealous platform worker was trying to get me to switch it off, in the end I had to take off a sock and tie is around the flipping tail light! Switches are good. Oh and as a PS, I have one of these Lyt and a Cyo T (60), and they are both great lights. I used the Lyt for a few years on un-lit rural roads before I upgraded (more as a treat rather then necessity). The Lyt is now 5 years old and going strong. Tried some AXA lights too, which are very cheap, and work well for the money. I think there is more engineering in the B&M lights though. With both the Lyt and the Cyo, I find that the beam pattern is soooo tight that the is no light that spills to the sides. This can be problematic when going around until corners, as you have to effectively steer in to darkness. By the look of the new Luxos ones on offer these seem to have solved this problem. Oh well, I think I know what I want for Christmas now! Has anyone powered their’s with a battery? John, it may not work. The dynamo hub produces AC and these lights may be designed expecting an AC source. Just to note that I’m testing USB power packs – having previously used up to 9V battery packs (as described on the DC dynamo lighting page I referenced up thread). I have a USB -> 9V boost pach, which does provide 9V (at up to ~800mA according to the specs). With the Lyt in place that voltage drops to 7V, despite the light only pulling 600mA (taillight connected to the Lyt output tails). I don’t measure any difference when I plug in with the positive into the + or – labelled inputs, nor when I plug into the outputs (I only tried that one way round though). That suggests to me that there is voltage regulation in the lamp which is fighting the voltage regulation in the boost regulator (and winning)… I need to work out what the best way to deal with that is (it might be to buy a 7V boost regulator if I can find a nicely packaged one).